Bill Towner was born on July 16, 1922. His father and uncle ran a store, Towner Brothers Inc., in north Rochester that sold mostly motorcycles, outboards and bicycles. He grew up during the tough times of the Depression years, and remembers his father, Frazier, having to borrow $300 to get his wife released from the hospital when his brother Larry was born. Frazier sold bicycles for 50 cents down and 50 cents a week. He worked six days a week in the shop then spent Sunday collecting his 50-cent payments. In 1933 Bill’s uncle quit the business and in 1938 his father moved the operation and expanded his inventory into radios, the booming cell phone business of that era. When that wave subsided in the 1940s, Frazier moved into guns and sporting goods. That’s when Bill, and later his brother Larry, joined the operation, shifting the emphasis to marine sporting goods, selling OMC outboards and Starcraft, Century and Cruiser boats. Bill kept his boat in Henderson Harbor on the west shore of Lake Ontario. When there on fishing trips he stopped at the shop of Ken Harris, a renowned decoy maker. He took sample decoys back to the store in Rochester, strictly taking orders at first. Bill later bought Ken’s work, both cork and cedar decoys, for inventory. They sold them for over 30 years, stopping in the 1970s when at $8.00 apiece they became too expensive for the average hunter. Bicycles remained a part of the inventory, becoming the main business in the 1960s. Bill says he made more money on a $200 bicycle than a $1000 outboard motor. He sold the store in 1983 and retired to his present home in Fishers, New York. Bill married Mary Elizabeth Hapgood in 1947and raised two daughters, Susan and Martha. Towner made the bulk of his decoys after his retirement from the store in 1983. He first made cork decoys for his own rig then moved to more decorative or ornamental decoys to sell at the decoy shows. These decorative decoys, made of pine, were patterned after the historic Stevens decoys that were made in nearby Weedsport. He used a brass brand to burn “WT” into the all his own work as well as some of the decoys he collected. After leaving it in the fireplace too long so it melted, he obtained a new one made of steel. Towner’s duck hunting rig consisted of cork pintails, wigeon and mallards. He made full-bodied geese and silhouettes of Canada geese, snows, pintails and mallards to use on the farm. For variety he carved three oversized swans to use for confidence decoys. He traded one of these massive swans to the late Long Island collector and dealer, Bud Ward, who reportedly sold it at auction for $1700. Cork pintail (at top) made in the early 1980s; later, a hollow pine model was added to his rig. In 1988 when the state mandated steel shot for duck hunting, Bill was in a dilemma. He used a C grade Fox side by side that he dearly loved and knew it would be damaged by steel. “I was too old and grumpy” to switch to steel, he says, and decided “the hell with it.” That sentiment was the catalyst behind a new line of decoys, mostly mallards, that he and his hunting buddy Al Seymour, nicknamed Bubs, christened “Shady Ladies” and “Bub’s Bad Boys.” Mostly mallards, they are oversized cork decoys with long wooden swivel keels. The keels hid cylindrical holes that Bill drilled just large enough to accept a single shotgun shell, eight in all, allowing Towner to sneak lead shot into the marsh. 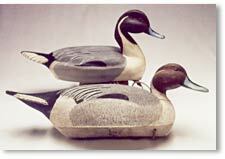 In 1996 he began making pine decoys for the rig, the first solid-bodied then hollowed with a bottom board. He made blue-winged teal (only hens), gadwalls, wood ducks and pintails. Towner’s collecting career began in the mid-1960s when a hunter brought a rig of used Harris decoys into the store and offered to sell them for $2.00 apiece. Bill bought them and spent the winter fixing the old blocks, returning them to Harris for repainting. He resold them to hunters for a decent profit and thought, “Boy oh boy, this isn’t bad!” Another early rig of 125 decoys proved affordable at $5.00 each. After picking out his keepers, he sold the rest back to hunters, not yet finding a market for collectors. In 1972 George Vanderbilt introduced him to an 80-year-old market hunter named John Burrows. Burrows and his father Cayuga Lake, one of the Finger lakes in central New York, for canvasbacks and redheads. They weren’t the only market hunters and the old gunner remembered as a child his father sending him to comb the shoreline after bad storms to pickup lost decoys that had drifted from other rigs. Towner was eventually able to purchase the gentleman’s entire rig, which consisted of Masons, Stevens, Wildfowlers and well as decoys by local makers. The old decoys became a passion, and that very year Bill began exhibiting at decoy shows, his first the 1972 Clayton show on the St. Lawrence River. Bill thought the river birds were more attractive than the lures used in central New York, so he always bought more at those early shows than he sold. He skillfully assembled one of the best collections of New York State decoys, specializing in St. Lawrence River decoys as well as those by Ken Harris, Chester Schuttie and Julius and Bob Middlestadt. Towner knew Bob Middlestadt, who owned a car dealership two blocks from Bill’s store. Over a three-year period Middlestadt occasionally stopped by the store to offer him decoys that Bob or his father had made. Bill has recently fell victim to a retinal disease, macular degeneration, which has cost him his central vision in both eyes, sadly ending his years of duck hunting and decoy carving. But he still pops up at the occasional decoy show. He’s retired from shooting at his beloved Vanderbilt club, but he still maintains a membership. His daughter Martha is a crack shot and likes to take him hunting. “Annie Oakley,” as he refers to his daughter, was a little too good last year. She folded a drake mallard that fell on her unsuspecting father, breaking his glasses, chipping a tooth and knocking him on his kiester.